Although the Heart sisters Ann and Nancy Wilson first found fame in Canada, a land where they appreciate a close harmony folk rock and beyond sound, they actually hail from Seattle, Washington and have been making high quality and highly successful albums since the early 1970s. 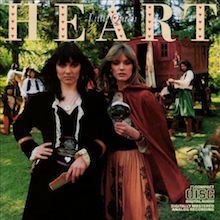 Heart’s AOR (Album Orientated Rock) style is often coloured by the sweet side of heavy metal with Ann winning a reputation as one of the finest vocalists in that field while sister Nancy is an expert songwriter. Both are adept musicians on every level and know how to put on a show and entertain their vast army of fans. They have sold over 35 million records worldwide since debut Dreamboat Annie exploded upon us. Major moments are many but the Heart, Bad Animals and Brigade discs are phenomenal sellers to this day and their various compilations are excellent places to begin your discovery – genuine greatest hits. It is also to Heart’s credit that they are pioneers in persuading other women to pick up the hard rock cudgels and their acoustic folk side is an influence on contemporary acts like The Pierces. Given their chart placings across four decades Heart are also the most successful female fronted band around, revolutionaries in that aspect. They were inducted into the Rock and Roll Hall of Fame in 2012. Legends of the Seattle scene their Bad Animals Studio has played host to everyone from Neil Young and R.E.M. to Soundgarden, Pearl Jam and Alice in Chains. Their band line-ups include an impressive array of players: Roger Fisher, Howard Leese, Scott Olson and former Spirit and Jo Jo Gunne ace Mark Andes have all enjoyed backing the Wilsons. A constant draw on the live circuit they have never become complacent. The Ann Wilson Thing EP is just out on Rounder Records and their most recent album Fanatic was produced by long time k.d.lang collaborator Ben Mink with a live interpretation Fanatic Live from Caesar’s Colosseum to capture them at their rocking best, playing hits old and new. The origins of Heart go way back to Washington area bands The Army and White Heart, male preserves both until first Ann and then Nancy joined the line-up. It soon became apparent that the duo was a more natural front for Heart music and having relocated to Vancouver the ensemble recorded Dreamboat Annie with producer Mike Flicker. Ann wrote nearly all the material with Nancy while guitarist Roger Fisher helped shape the signature sound. Adding some unusual instrumentation – flute, bells – and subtle orchestral arrangements courtesy of musical director Howard Leese, this disc began as a slow burner and then took off, making #7 on the Billboard Top 200 and eventually arriving in the British Top 40 in 1977. Bolstered by the rapid acoustic rhythms of “Crazy on You”, “Magic Man” and the title piece, Dreamboat Annie was a refreshing alternative to the norm. Wistful lyrics and impeccable band work called to mind Fleetwood Mac and Jefferson Starship, adding elements of pomp and progressive to the mix a la The Moody Blues. The market for this sound meant that 1977’s Little Queen should have been a no-brainer whereas it’s gestation was beset by label problems. In the end Heart had the last laugh as “Barracuda”, “Kick It Out” and “Little Queen” stormed the charts and sent the parent disc triple Platinum in the US and double Platinum in Canada. Impressed by their careful synthesis of Led Zeppelin styled hard rock and less heavy acoustic folk pieces like “Treat Me Well” and “Cry to Me” Heart found themselves elevated by their audience to superstars, despite legal wrangling with their Mushroom Records mentors. After a contract filling compromise, Magazine, they returned in fine fettle with Dog & Butterfly, the more natural follow-up to Little Queen with the now familiar collision course between gentle build ups and heavy rock crescendos lending their stage shows the atmosphere of ritual. The classic Bebe le Strange (available in a 2004 Remastered Edition with bonus tracks) and the first Greatest Hits/Live – a compilation of both aspects – made Heart mainstays of Hot mainstream Rock, AOR and FM. Private Audition and Passionworks ended the first chapter with Denny Carmassi and Mark Andes joining for the latter album, replacing Steve Fossen and Mike DeRosier. Their debut on Capitol was simply called Heart – a new beginning. Producer Ron Nevison (The Who, Bad Company, Led Zeppelin, Kiss, Grand Funk Railroad et al) added a crisp dynamic to a set of songs that are Heart’s most successful to date. A number one album with a number one single, “These Dreams”, plus four additional hits – “What About Love”, “Never”, Nothin’ At All” and “If Looks Could Kill” - this was a runaway triumph blessed with new shades of power pop and brilliant mainstream rock hooks. This is recommended as a good place to pick up on the Wilsons because the crossover charm of the singles is balanced with flawless musicianship and some hot guests – Grace Slick, Peter Wolf, Mickey Thomas and Holly Knight being the pick of the crop. Bad Animals is a departure with songwriting shared out to specialist pop anthem writers like Diane Warren, Tom Kelly, Billy Steinberg and Lisa Dalbello, as well as long time friend Sue Ennis, a mistress of Classic Rock. Following suit the Brigade album is another all-collaborative affair with pop shine provided by producer Richie Zito, an expert in glossy wraparound panoramas. Bursting with hits like “Stranded”, and “All I Wanna Do is Make Love to You”, Brigade was a constant radio presence throughout 1990 with Ann concentrating on the lead vocals while Nancy added more instruments to her repertoire. Rock the House Live! (1991), recorded at the Centrum, Worcester, Massachusetts, was a diversion that concentrated on arena rock but Desire Walks On is more representative of their complete style. Layne Staley from Seattle grunge band Alice in Chains sings with the girls on their version of Bob Dylan’s “Ring Them Bells” and there is a renewed vigour and tougher approach that benefits the whole thing. John Paul Jones from Led Zeppelin produced The Road Home, one of their finest middle period efforts. With their as close as blood version of The Everly Brothers “Love Hurts” as the centerpiece this is highly recommended for discovery. Other highlights are a cover of Joni Mitchell’s “River” and a revisitation of “Dreamboat Annie (Fantasy Child)”, plus excursions into symphonic pop with Seattle Symphony and London Metropolitan String Quartet. These Dreams: Greatest Hits is Heart’s final album for Capitol Records (1997) and is a proper career-spanning disc that runs from 1975 to 1995 with alternate live acoustic versions in places. Following a spate of other Hits packages Heart return to our fold for Alive in Seattle, which contains two Zep covers – “The Battle of Evermore” and “Black Dog” - as well as a startling take on The Sonics’ “The Witch” - garage rock nirvana – and several new songs. Red Velvet Car (2010) is one of our newer favourites. This is where Ben Mink adds his magic, co-writing six tracks and modernizing their approach a treat. The career spanning box-set Strange Euphoria contains plenty of rarities, demos, unreleased live material, plus the bonus Heart Zeppish. Fanatic brings them up to date while keeping a weather eye on their trademark hard rock and folk rock skills, also some of their best writing. The duet with Sarah McLachlan on “Walkin’ Good” is worth the price of admission alone. In the meantime, if you develop a taste for all things Heart shaped, then try Ann’s solo debut Hope & Glory, a magnificent suite of covers on artists like The Youngbloods, Creedence Clearwater Revival, Pink Floyd, John Lennon, The Animals, Dylan and Led Zep. Not to be outdone Nancy scored the 1996 film Jerry Maguire and produced the hootenanny gem Live at McCabe’s Guitar Shop. She has also provided the music for Almost Famous, Vanilla Sky and Elizabethtown. Immensely talented, durable to the extreme and with a catalogue of classics that enrich the airwaves, Heart continue to beat strongly. They are amongst the elite of classic hard rockers. For further elucidation also try their own tale Kicking & Dreaming: A Story of Heart, Soul and Rock & Roll (Harper Collins), but mostly discover the music. It won’t let you down. Heart was pretty much considered washed up when they released Heart in 1985. They learned a few important things while they had taken a short sabbatical -- they knew that hooks were important and they knew they could play up their looks for MTV. So, they delivered both with Heart, giving their audience anthemic hooks and tightly corseted bosoms, leading to the most popular album they ever had. This doesn't mean it's the best, since its calculated mainstream bent may disarm some long-term fans, but it is true that they do this better than many of their peers, not just because they have good polished material from professional songwriters but because they can deliver this material professionally themselves. Yes, "These Dreams," "Never," and "What About Love" don't quite fit into the classic Heart mode, but they are good mid-'80s mainstream material, delivered as flawlessly as possible. There's still a lot of filler on this record, but the best moments are among the best mainstream AOR of its era. In the 1980s and '90s, numerous women recorded blistering rock, but things were quite different in 1976 -- when female singers tended to be pigeonholed as soft rockers and singer/songwriters and were encouraged to take after Carly Simon, Melissa Manchester, or Joni Mitchell rather than Led Zeppelin or Black Sabbath. Greatly influenced by Zep, Heart did its part to help open doors for ladies of loudness with the excellent Dreamboat Annie (reissued on a gold audiophile CD by DCC Compact Classics in 1995). Aggressive yet melodic rockers like "Sing Child," "White Lightning & Wine," and the rock radio staples "Magic Man" and "Crazy on You" led to the tag "the female Led Zeppelin." And in fact, Robert Plant did have a strong influence on Ann Wilson. But those numbers and caressing, folk-ish ballads like "How Deep It Goes" and the title song also make it clear that the Nancy and Ann Wilson had their own identity and vision early on. Switching from Epic to Capitol with 1985's Heart proved to be a wise move for the Wilson sisters, who experienced a major resurgence in popularity and gained many new followers. 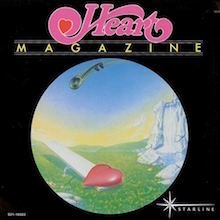 Heart's arena rock sound had become even glossier, and the band was selling more albums than ever. But for all its production gloss (courtesy of Ron Nevison) and pop slickness, Bad Animals comes across as sincere rather than formulaic or cynical. From the rockers "You Ain't Too Tough" and "Easy Target" to the power ballads "Alone" and "Wait for an Answer," all of the songs are quite memorable. The folk elements and acoustic leanings that characterized many of Heart's early ballads were long gone, and the Wilson sisters keep the volume high but slow the tempo. 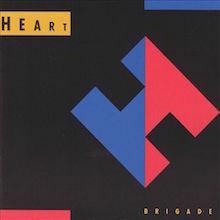 Heart entered the 1990s with Brigade, which isn't quite as strong as Heart or Bad Animals, but is nonetheless a respectable effort that has more pluses than minuses. While producer Richie Zito's approach is undeniably slick and glossy, he maintains enough rough edges to keep things interesting on songs ranging from the aggressive hard rock of "Call of the Wild" (not to be confused with the Ted Nugent/Amboy Dukes classic), "Wild Child," and "The Night" to the arena-oriented powerful ballads like "Stranded" and "Secret." Heart unintentionally generated some controversy with the hit "All I Want to Do (Is Make Love to You)," a tale of an intimate encounter with a hitchhiker. The "Thought Police" argued that the song encouraged women to endanger themselves by picking up hitchhikers -- overlooking the fact that the song, like a romance novel, is pure fantasy. Though Heart or Bad Animals would serve as a better introduction to Heart's Capitol output, Brigade is an album that die-hard fans shouldn't overlook. When Desire Walks On came out in 1993, a lot of arena rock, pop-metal and hair metal artists felt like the rug was being pulled out from under them. Alternative rock had become rock's primary direction, and bands like Heart were being made to feel antiquated and passé. 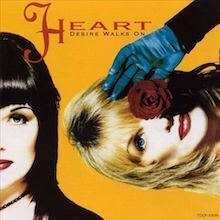 Desire Walks On had a lot working against it--not only did have Heart have to contend with radical changes in the marketplace, but also, the CD suffers from unevenness and a shortage of really strong material. Although Desire Walks On isn't a bad album, it isn't one of the Wilson Sisters' more memorable albums either. The catchy "Back To Avalon" is a gem, and Heart is enjoyable on Robert "Mutt" Lange's power ballad "Will You Be There (In The Morning)," the adult contemporary ballad "The Woman in Me" and a cover of Bob Dylan's "Ring Them Bells." But on the whole, Desire Walks On is unimpressive. Obviously the least essential of Heart's Capitol releases, this CD is strictly for completists. Problems with the Mushroom label delayed the release of Magazine, which eventually went platinum and peaked at number 17 on the album charts. Only the hard-rocking "Heartless" made it into the Top 40, and the album didn't really live up to Heart's last few efforts. 1976's Dreamboat Annie showed stronger songwriting, while Little Queen had a lot more bite to it. Magazine lacks in energy and, to a much greater extent, fluency. The songs sound careless and scrambled together, and while some of the blame can be placed on the label controversy, it's apparent that the Wilsons seem unconcerned, for the most part. "Here Song," "Just the Wine," and the predictable "Without You" all have weak seams in both the writing and the articulateness of the tracks as a whole. 1978's Dog & Butterfly shows more interest and rock & roll vitality than its predecessor, making Magazine an album even the band likes to forget about. 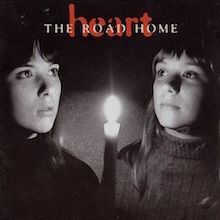 On The Road Home, Heart re-records some of their biggest hits acoustically live in concert. It's interesting to hear these arena rock and AOR standards -- including "Barracuda," "Crazy on You," "Dreamboat Annie," and "All I Wanna Do Is Make Love to You" -- recast as intimate numbers; Heart manages to find new layers in all of these warhorses, partially due to the sublime production of John Paul Jones. The result is Heart's best album in years -- the old material sounds more alive than anything they have written in a decade. Some classic rock reunions are driven by marketing, some driven by a desperate need to reconnect to the past, some exist merely for the music. 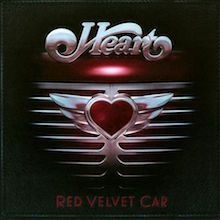 Red Velvet Car, Heart’s first album since 2004’s Jupiter’s Darling, belongs to the latter camp: it’s music with no seeming commercial aspirations, music that is connected to the past but doesn’t strive to replicate it. Heart eschews their teased, corseted ‘80s bombast and sticks to the Zep worship of the ‘70s, an obsession that’s proved quite fertile. The Wilson sisters are clearly older than they were when they belted out “Barracuda” -- the tempos are generally slower, Ann’s voice doesn’t reach the same heights -- but they embrace their age, a move that gives their excursions into folk including a revival “Sand” from their 1990 Lovemongers sideproject, a record that pointed the way toward the textured movie here. Red Velvet Car has something of a meditative mood -- the punchy Townshend power chords are used as color, not fuel -- triggered somewhat by a preponderance of textured, acoustic-laden arrangements and miniature epics, all elements that hearken back to Heart’s golden age yet wind up feeling right in line with their vibe in 2010. 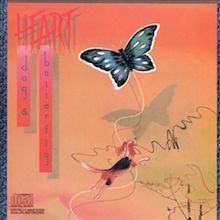 Dog & Butterfly became Heart's fourth million-selling album and placed two songs of opposing styles in the Top 40. Like their Magazine album, Dog & Butterfly peaked at number 17 on the charts, but the material from it is much stronger from every standpoint, with Anne and Nancy Wilson involving themselves to a greater extent. The light, afternoon feel of the title track peaked at number 34, while the more resounding punch of "Straight On" went all the way to number 15 as the album's first single. With keyboard player Howard Leese making his presence felt, and the vocals and guitar work sounding fuller and more focused, the band seems to be rather comfortable once again. Average bridge-and-chorus efforts like "Cook with Fire" and "High Time" aren't spectacular, but they do emit some appeal as far as filler is concerned, while "Lighter Touch" may be the best of the uncharted material. 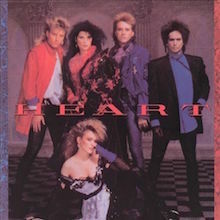 After this album, guitarist Roger Fisher left the band, but Heart didn't let up. 1980's Bebe le Strange showed an even greater improvement, peaking at number five in April of that year. 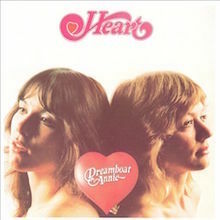 After acquiring a substantial following with Dreamboat Annie, Heart solidified its niche in the hard rock and arena rock worlds with the equally impressive Little Queen. Once again, loud-and-proud, Led Zeppelin-influenced hard rock was the thing that brought Heart the most attention. 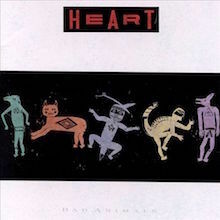 But while "Barracuda" and "Kick It Out" are the type of sweaty rockers one thought of first when Heart's name was mentioned, hard rock by no means dominates this album. In fact, much of Little Queen consists of such folk-influenced, acoustic-oriented fare as "Treat Me Well" and "Cry to Me." Anyone doubting just how much Heart's ballads have changed over the years need only play "Dream of the Archer" next to a high-volume power ballad like "Wait for an Answer" from 1987's Bad Animals.